I am very excited, happy and proud to present you a set of live music performed on a green sparkle drum set with hurricane Katrina-water infused-cymbals, various percussion instruments from around the world, some homemade instruments as an Urban Kunan, a Glockenspielcycle and a few iPhone apps as Bloom, and more! For my solo concerts, I have been focusing on creating a sonic environment composed of many short pieces of different aural shape, texture and color. My idea is to shape the 60 minute set of music very much like a children's painting. I want to make pink skylines with huge bright yellow smiley faced suns. I want to color inside and outside the line. More outside than inside. In this show, I will be performing some instant compositions as well as brand newly composed pieces that owe their birth from my love of the blues, classical music, hard hitting rock 'n roll, New Orleans 2nd lines, world music, tonality, atonality, black, white, pink. SUNDAY AT SIX FIRST ANNIVERSARY CONCERT IN CONJUNCTION WITH FUND ART NOW AT THE COLLECTIVE HARDWARE EASTER SUNDAY, 04 , APRIL 2010! NY BASED JAPANESE-AMERICAN FLUTIST AND COMPOSER WILL PERFORM AN ASCENDING FLUTE SOLO CONCERT. SHE WILL PRESENT THE NEW PIECES FROM HER RECENT DREAMS AND ALSO INTERACT ITH THE ART PIECES EXHIBITED. "YUKARI IS ONE OF THE MOST UNIQUE AND TALENTED FLUTISTS THAT I HAVE EVER ENCOUNTERED. I AM TRULY IMPRESSED BY BOTH HER WILL AS WELL AS HER DARING MUSICAL SPIRIT. SHE IS BOUND TO TURN THE IMPROVISED MUSIC SCENE ON IT'S EAR AND I CONSIDER HER TO BE A TRUE ARTIST IN EVERY SENSE OF THE WORD." AKIM FUNK BUDDHA AND AARON SHRAGGE BRING TOGETHER THE DIVERSE WORLDS OF THE HUMAN BEAT BOX, THROAT SINGING AND THE SHAKUHACHI (JAPANESE BAMBOO FLUTE). THE RESULTS ARE AS MYSTERIOUS AS THEY ARE FUNKY, PLAYFUL AS THEY ARE MARTIAL AND SERENE AS THEY ARE URBAN. work of Brian Reed and poetry of Daisaku Ikeda. A HIGH-ENERGY ACOUSTIC GUITAR DUO, MERGING MEDITERRANEAN-GYPSY MUSIC WITH JAZZ MENTALITY AND ROCK ATTITUDE. ISRA-ALIEN, A BAND DEEPLY ROOTED IN ISRAEL'S DIVERSE MUSICAL TRADITIONS, WAS BORN THROUGH MANY YEARS OF MUSICAL COLLABORATIONS AND ONGOING DISCUSSION ABOUT VARIOUS MUSICAL CONCEPTS. THE RESULT IS A UNIQUE FUSING OF A MYRIAD OF MUSICAL TRADITIONS (GREEK, BALKAN, EASTERN-EUROPEAN, AND JEWISH/KLEZMER), WITH DARING IMPROVISATIONS AND INVENTIVE TEXTURES, SHOWCASING BOTH GUITARISTS' MUSICAL WORLDS. 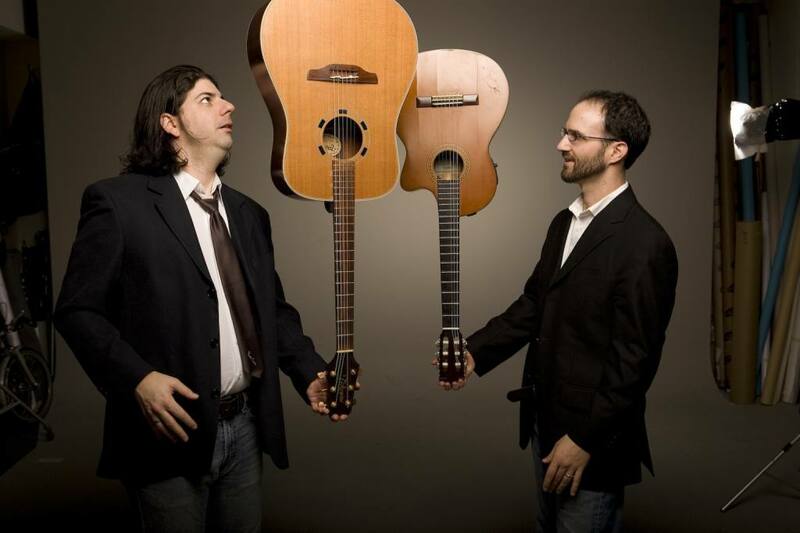 GILAD BEN ZVI AND OREN NEIMAN ARE BOTH ISRAELI GUITAR PLAYERS WHO MOVED TO NEW YORK EIGHT YEARS AGO AND MADE IT THEIR MUSICAL HOME. THE LOST SHORES IS A TWELVE-PIECE BAND IN WHICH THERE IS CURRENTLY ONLY ONE MEMBER. THE BAND WAS FORMED BY RICHARD AUFRICHTIG IN MAY OF 2009, WHEN THE IDEA CAME TO HIM TO MOVE BEYOND THE REALM OF THE CONFESSIONAL AND INTO A NEW FORM OF SONGWRITING THAT EMBRACED CHARACTER, NARRATIVE AND STORY. THIS IDEA HAS RESULTED IN OVER 100 SONGS AND THREE RELEASES: THE FULL LENGTH POSTCARDS FROM THE LOST SHORES, THE DIGITAL 7 "PARIS, FRANCE," AND THE UPCOMING "THE KING OF MANHATTAN" EP. This will be a special evening featuring violinist Erika Kapin in a solo performance of her original compositions. This performance will be the debut of many new works written specifically for solo violin. It is sure to be a fresh, and intimate evening. Imagine two characters, a song bird and a clown, who have gone just a little crazy. Ms. Kveli, the lovely song bird, is renowned for her sweet and airy voice, but she does occasionally scream, growl or ramble. Our sweet clown, Ms. Tamura always tries to capture and torture the song bird with her mighty toys. They will tell their story using any method of communication, music primarily, adding dance, mime, colors and shapes...anything you can imagine. Miss Kveli is a Norwegian soprano, currently enrolled in the Contemporary Performance Program at the Manhattan School of Music. She received her Bachelor’s Degree in Tromsø, Norway, where she also got her teaching degree as a voice teacher, focusing on voice therapy. A winner of the 2008 Fuchs Chamber Music Competition, Miss Kveli specializes in early and contemporary music, as well as composing her own music in a modern folk style. Asami Tamura, a native of Japan, is an entertainer who loves to make her audience happy through things she purely loves. Ms. Tamura’s main weapon to do so is music, so she call herself as a musical entertainer. 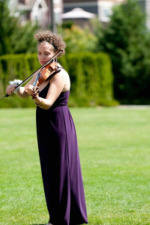 Trained in classical music, she holds both BM and MM in piano performance from Manhattan School of Music. Her vast interests extend her experience to jazz, pop, rock, Indian, and Japanese music. Recently, she found her love in toys, especially toy pianos, and had the honor to receive a piece for toy pianos written for her. She also enjoys working with visual artists and the experiences that give her opportunities to bring out her theatrical abilities. BRIAN LINDGREN WEAVES TOGETHER A SONIC EXPERIENCE FEATURING HIS OWN ELECTRONIC COMPOSITIONS. WILL FEATURE COMPUTER, VIOLA AND VOICE. "Janelle Reichman and Steve Whipple look forward to bringing their jazz sax/bass duo to the Chair and the Maiden Gallery on January 10th. The two began playing duo together 8 years ago when they were next door neighbors in Cincinnati, Ohio. Over the years their duo has become increasingly dynamic, interactive, spontaneous, and improvisational, making their performance a treat for audiences large and small. They will perform a combination of jazz standards and original compositions at their performance at Chair and the Maiden." Flutist, Nicole Camacho and soprano, Megan Schubert--a duo cemented by friendship and frequent collaboration--will present a program of art music that continues to bring the limits of expression and established languages and roles of their instruments into question. From the sounds of Inuit Throat Singing to Schoenbergian Sprechstimme, many of the sonic and narrative ideas will collide and coalesce in the charged experience of live performance. Special guests: Domenica Fossati, flute, and Matthew Ferry, percussion. Davy Mooney and the Ghosts is the new singer-songwriter project from world-renowned jazz guitarist Davy Mooney. Mooney has been leading a double life for his entire musical career: he is well known on the international jazz scene as a melodic and harmonically sophisticated guitarist, but for the past 15 years he has been performing solo in coffee houses and small bars singing his bittersweet, nostalgic songs to old folkies and young indie-rockers. Although some of the songs go back 10 years or more, Mooney hadn't gotten around to recording them until this past year. The CD is "Ghosts of Music, Past", and the band Mooney has put together to perform the music is called, fittingly, the Ghosts. Why the supernatural theme? Because Mooney has been haunted by these songs for years; they come from the past and are rife with regrets and shadowy memories. The record is stylistically diverse, but many of the songs deal with relationships, doubts, and complex, mixed emotions. The Ghosts are a band of virtuoso musicians that bring depth and musicality to Mooney's tunes. Listen and be transported! KaleiDhaPhonic is a collage of colors stretched over a canvas of space and time to create a beautiful painting of sound - kind of like an artist's easel having a conversation with itself. The music is based on the interactive conversational dance between the tabla and mbira, and has the beautiful sounds and colors of kora and flute(s) that emphasize different highlights of the sound.
" Through rhythmic and sonic exploration, Drummer / Human Being Martin Urbach creates an environment where everything is game. Pretty/Ugly,Loud/Soft, In/Out, Solid/Liquid and everything in between. In this occasion, he will explore sounds from times and cultures far gone as well as the sounds that envelop our current world. The concert will consist of free improvisations on a green sparkle drumset, soundscapes using iPodtouch apps, classical pieces, field recordings from Ghana, frame drums, poetry interpreted on percussion instruments and a percussive reflection on a a Surprise Work Of Art . " Becky performs her own work around New York City. contrapuntual arco lines to accompany her. all based on real events, both personal and historical. But in all seriousness, we are an energetically eclectic group, exploring and expanding music from many styles including hip-hop, jazz, latin, avante-garde and a little classical. We play either our original compositions or outward leaning arrangements of standards. The idea of the group is to re-organize normal sounds, to shine our contemporary light on tradition, to “explore musical spaces.” We have collaborated with several different artists, video, and vocalists. Every show features “special guests,” free elements, who explore the music in their own way and contribute their perspective to the group, transiently transforming the group in the process. The Mighty Third Rail, aside from being a clever riff on that special rail on the train tracks that will shock the ‘ish out of you, and aside from being a metaphor in politics to avoid controversial issues, is also a brand spanking new band that mixes the elements of hip hop poetry, beatboxing, violin and bass. A 3 man squadron lead by Actor/Poet extraordinaire Darian Dauchan and featuring the indelible Ian Baggette on Bass, and the charming Curtis Stewart on violin. When they're powers combine they produce a unique voltron of a sound the likes of which the world has never heard. But no one can be told what The Mighty Third Rail is, you have to experience it for yourself. Hello Potential Listeners, audience members, and gallery goers. In preparing this description of music I have composed for the weekly music series at Chair and the Maiden Gallery I initially began to write about myself and music in the third person. It went something like: Mr. Pate's music combines the aesthetics of Baroque Romanticism with a spontinaity of jazz steeped in the singer/songwriter tradition. Well first, that sounds lame, and second, I felt strange writing about myself and music that comes from a personal place in the third person. So against common practices, and at the risk of sounding self absorbed, here we go in the first person. Judith Insell, a New York native, is a versatile viola player who is at ease in a large rage of styles: Jazz, Classical, Avant Garde, R&B, Hip Hop, Pop & Rock. As an active member of the New York jazz scene since the mid nineties, she has recorded & performed with Lee Konitz, Greg Osby, Steve Coleman, Antonio Hart, Miguel Zenon, Elliott Sharp & Sojourner. Her "pop" music career includes performances with: Beyonce Knowles, India.Arie, Jessica Simpson, “Joe,” and the legendary John Cale. Reut Regev, born and raised in Israel, has been living in the New York City area since 1998. A master of the Trombone and the Flugabone, Ms. Regev showcases her in versatility in many style: Jazz, Salsa, Rock, Funk, Brazilian, Blues, Classical, Contemporary, Jewish and Caribbean music. She has collaborated with many outstanding jazz artists: Butch Morris, Anthony Braxton, Groove Collective, Frank London, Eddie Bobé, Eric Revis, Billy Bang, Michael Attias, Ras Moshe, Reggie Nicholson, just to name a few. Nemanja Rebic (composer of all songs on this site, guitar and percussion) was born 07.07.1979. in Novi Sad- Serbia. In Amsterdam he studied classical, jazz and world music at Conservatorium Van Amsterdam where he graduated in 2005. He also studied tabla and north indian musical systems in the Netherlands. December 2006 he went to India to play and study indian classical music where he stayed 6 months studying south indian vocal and percussion. Currently he resides in New York City where he plays, composes and teaches. His music originates mainly from Jupiter and Venus, the strawberry fields of guitar-asia while he combines the various styles from planet Earth. Among the other things he applies indian percussion techniques on guitar and lots of coconut oil. In what seem like meager beginnings, In One Wind has blossomed from a one man act into a full fledged six piece ensemble, with a sound and reputation all their own. The brainchild of guitarist/vocalist Angelo Spagnolo, In One Wind also features vocalists Mallory Glaser and Lily Claire Nussbaum, bassist Rob Lundberg, percussionist Max Jaffe and multi-reedist Steven Lugerner. Though steeped in the tradition of folk music, In One Wind incorporates a wide range of influences from jazz to country, even stretching effortlessly into the world of improvised music and the avant-garde. The ability to start a show with soft guitar strums and whispered vocals while seamlessly breaking into odd-metered grooves and lush three part harmonies enraptures their audiences. In One Wind is truly an idiosyncratic ensemble, an ensemble that appropriately represents their home - Brooklyn, NY. Being one of today's most distinguished musical hotbeds, it’s fitting that In One Wind shares their home with other Brooklyn luminaries such as Grizzly Bear, The Dirty Projectors and Sufjan Stevens. Their current residency at Williamsburg’s Spike Hill is just one example of their growing demand in the New York music scene. Plans are in motion for their first EP release, due out by the end of the fall. Sunday, October 18th, vocalist Kelsey Jillette will join organist kAZU for a performance of lyrical, wide-ranging straight ahead jazz: standards, folk and pop music steeped in the classic American jazz tradition. 6pm. $6 suggested donation. Also, don't miss the October 22nd show at Greenwich Village's 55 Bar, just down the street, with her 5-piece organ band. A current list of performances is posted on www.kelseyjillette.com along with live and studio music and free downloads. "Kelsey Jillette cuts to the heart of a song with a canny incisiveness that belies her age. Her voice, all honey dewed ripeness, seems to inhabit disparate styles as naturally as taking successive breaths. It’s been ages since I’ve heard such self-possession in a young jazz stylist. 'The Water is Wide' is her album and Jillette’s prospective horizon stretches as far, and beyond." Chair and the Maiden will feature his solo electronic compositions. 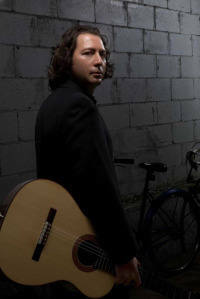 Tibagui Trio, led by guitarist and composer Alejandro Flórez, started out as a project to perform the subtle, expressive music written for the Colombian guitar trio. The ensemble of bandola (relative of the mandolin), tiple (resembling the Cuban tres) and guitar has been for generations the standard of the music in the Andes of Colombia. Bambuco, guabina, pasillo, danza and marcha are some of the dance-able grooves played in the country’s mountainous regions. The music of Tibagui is directly related to this rich legacy made up of Indigenous, African and European elements. Tibagui is now redefining its musical heritage. In its expanded version, the group features the guitars alongside the sophisticated sounds of clarinet, flute, double bass and percussion. The band members, well- versed in jazz and different Latin American genres, bring together their experiences to tell an exciting story of tradition and innovation. "Bringing together their diverse cultural and musical backgrounds, this unique trio will commence its debut performance at the Chair and the Maiden Gallery. Erika Kapin(violin), JP Schlegelmilch(accordian), and Martin Urbach(percussion) will be presenting a colorful menu of music including Middle Eastern classics, original compositions, and in the spirit of the ArtLive exhibition, a debut performance of a couple completely fresh and new compositions." Miss Kveli is a Norwegian singer and songwriter, currently situated in New York City. Her songs and way of singing fits the description folk music, leaning into classical contemporary art song. Her artistic focus is to tell important stories, and to create an atmosphere where one can think and reflect. The stories are often very biographical and honest, others not at all, but they all tell figurative stories that the writer did resonate with at some point. Now hopefully they will ressonate with something in you. Her voice is highly diverse, even multiformal. Going from clear, simple, almost childlike sounds, to a rich and mysterious tone world that you would not expect out of this innocent-looking girl. Her stories are brave but fragile and open hearted, her music soothing, uplifting, or sometimes, when it’s needed, provoking. DiLiA* is a Latin Country music artist who's roots stem from Mariachi, Country, Jazz and Latin Jazz. Performing at Chair and the Maiden on Sep 13th alongside Benji Kaplan on Guitar, Erika Kapin on Violin and Martin Urbach on Cajon! "Through the use of imagery, spontaneous improvisation, through composition and humor, the Erika Kapin Trio aims to bring joy, inspiration, and groove and the world. Marco Oppedisano (electric guitar) and Martin Urbach (drums/percussion) create an experimental world, blurring the line between conventional and unconventional instrumental sounds. The spirit of this duo lies in the unfurling of musical ideas, weaving their way through the unexpected, all the while resulting in a complex world of dialogue and introspection. By bending the rules of sound, rhythm and form, Oppedisano and Urbach are granted the freedom to express themselves in an improvised setting consisting of fixed musical ideas and elements of surprise. Trumpeter Pablo Masis brings his creative voice to a trio setting with a performance of original jazz compositions from his latest release. Pablo's work has been recognized at the Betty Carter Residency at the Kennedy Center and at the Banff Centre's Workshop in Jazz and Creative Music. Joining him for this performance are Bassist Dave Speranza and Guitarist Assaf Ben-Nun. Tiger Lilies is a newly formed duo based in New York City, composed of violinist Trina Basu and cellist Amali Premawardhana. As two emerging artists with roots in India, Sri Lanka and North America, Trina and Amali aspire to discover and bring to light the music of their own cultural backgrounds as well as music from other parts of the world that has deeply inspired them. Drawing upon influences of nature, beauty, simple folk melodies and complex classical compositions, Tiger Lilies seeks to blend creative improvisations and arrangements with authentic traditions. Inspired by the moment, Environment,Without rules, Taste, Mood setting, Texture, Playing without memory. "a fine young jazz vocalist"
"Israeli born pianist Shimrit Shoshan and Seattle native violinist Erika Kapin will be collaborating this evening as they join in a presentation of each others' compositions. While these upcoming artists are rooted deeply in the jazz tradition, their music strives to express creativity in unique and personal manner. "Drummer Martin (pronounced mar-TEEN) Urbach juxtaposes his Bolivian and Jewish roots with his experience as an immigrant in the United States, to add color to his sophisticated jazz grooves. This will be Martin's first solo drums/percussion/ipod touch public performance in NYC.The set will be made up of instant compositions, renditions of songs from the American standards songbook and some classical compositions." Ko Ko Ro is the combined works of Dru Barnes an avant-garde turntablist with minimalist aesthetics deeply rooted in NEO-Dada noise music and visual arts, and Aaron Shragge who studies Indian vocals as well as Shakuhachi flute. Ko KoRo is a seamless blend of experimental sound and noise performance created in combination with traditional instruments and new media. Asami Tamura is an award-winning Japanese pianist who just loves to entertain her audience (which is YOU!) She says "I just want to be an entertainer, through the things I purely love. There are no boundaries-either I love or I do not. I believe if I enjoy, you will enjoy. I feel happy when I see your smile. Nothing makes me happier than that. So it's time for Toy piano!" Asami Tamura, a native of Kyoto, Japan, has been active as a piano soloist and chamber musician throughout the United States, Greece and Japan. Her performance repertoire covers not only classical music, but also Jazz, Indian, and Japanese styles. Since her very first piano lessons as a young girl, Ms. Tamura has always wanted to pursue a career in music. She has won several competitions and awards including the PTNA Competition, Kyoto, the Classical Competition, Tokyo, Japan and the Isabel Scionti Piano Competition, TX, U.S.A., and has appeared with the Sofia and Yamanami Orchestras. Ms. Tamura holds Bachelor and Master degrees in Music from Manhattan School of Music where she worked under the tutelage of Constanse Keen and Maria Asteriadou. Enjoy the harmony created by two beautiful instruments-bell like sounds of a gorgeous grand piano shape toy piano made by Schoenhut, the “Steinway” of its kind and a fabulous shiny silver alto flute made by Jupiter, the reliable high crafted art piece. Compositions by John Cage, Derek Hurst, Ippei Inoue (Premiere), Jerome Kitzke, Julia Wolf and more. After spending a wonderful month in Canada, playing with some incredible musicians and enjoying the beautiful sight of the region of Alberta, the EXPERIENCES OF TODAY concept is back to NY. Jamie Begian, Frank Carlberg, Sherisse Rogers, and Jeff Fairbanks. "With music as our vessel in the exploration of many aspects in life including communication, connectedness, evolution, and balance, the Erika Kapin group strives to share with you from our musical journeys. We are deeply seeded in the jazz tradition and also enjoy experimenting with elements of Middle Eastern and American folk music. We hope our music will bring you a message of inspiration, healing and joy." Amos Fisher blends the anomalous ingredients of folk, jazz, chamber music, and even punk rock with abstract, introspective lyrics to create a reflective musical journey. Combining the intensity of Tool or Pink Floyd with the intimacy of Joni Mitchell or Nick Drake and a touch of Hermann Hesse, Amos hopes the music “makes you listen differently. Entertainment is secondary with Art.”. This trio is an unlikely merging of three distinct personalities whose mad exploration of sounds has brought them together in various performance settings over the past three years. Now, they appear for the first time in their own self-directed trio. Max Jaffe, the drummer, is originally from San Francisco, California, and spent his high school years exploring the possibilities of social rebellion through music. He participated in several protest performances across the West coast that involved the creation of experimental sounds as a non-violent means of demanding social reform. During this time, he began accumulating a library of percussion instruments as he made his way across America by car, performing in such diverse venues as aquariums and jailhouses along the way until, in 2007, he arrived in New York and immediately became a part of the city’s avant-garde music scene. Raffi Garabedian, the trio’s tenor saxophonist and singer, hails from Armenia. His musical father introduced him to Armenian folk song and dance at an early age, and he soon rose to prominence as a free-lance clarinetist. He toured Eastern Europe with various groups for years until he was given a tenor saxophone by his uncle in 2004 and, by 2006, had developed such a passion for experimental music that he moved to New York to attend the New School University. Ross Gallagher, the bassist, was raised on a farm in Northern Maine. His family lived without electricity until he was 11, and emphasized creative expression in everyday life. Ross explored painting, pottery, and writing before he found the upright bass. He focused on music after that, but always emphasized the importance of the all the arts in influencing his playing. Renowned saxophonist Bob Mintzer says of Janelle: "She is a joy to listen to, and to play with." Emmy and Grammy award winning composer Patrick Williams calls Janelle Reichman “a consummate musician with maturity to her playing that is way beyond her years. I cannot recommend her highly enough.” Alan Pasqua, pianist for The Temptations, Ray charles, and Aretha Franklin says of Janelle: "She is a fresh new voice in a music that is sometimes full of clichés.” Janelle Reichman, saxophonist, clarinetist, flutist, composer, and educator, has had the honor to perform with big names such as Doc Severinsen, Nneena Freelon, Anne Hampton Callaway, Sherrie Maricle and DIVA, Tim Ries, Ted Rosenthal, Dave Liebman, and many others.